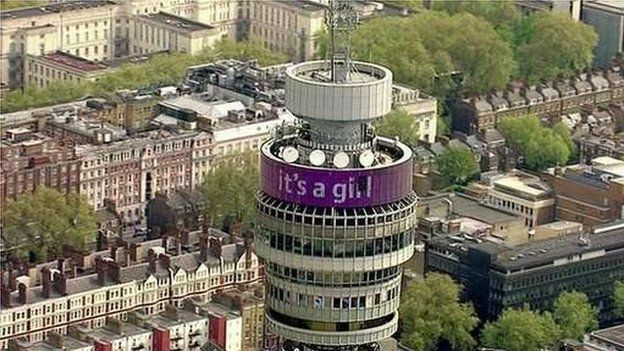 The Duchess of Cambridge has given birth to a girl, Kensington Palace has announced. 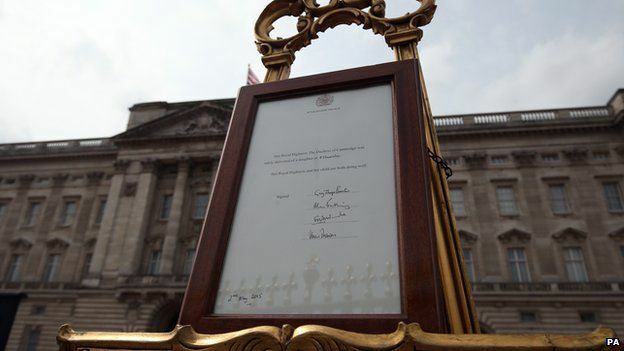 The princess - who is fourth in line to the throne - was "safely delivered" at 08:34 BST, the palace statement said. 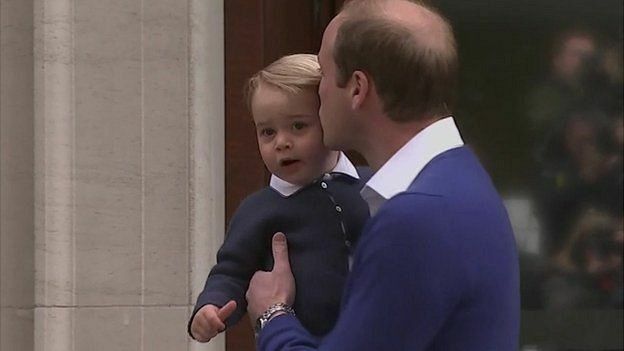 The Duke of Cambridge, who was present for the birth of the 8lbs 3oz (3.7kg) baby girl, brought his 21-month-old son Prince George to visit his sister at St Mary's Hospital, west London. 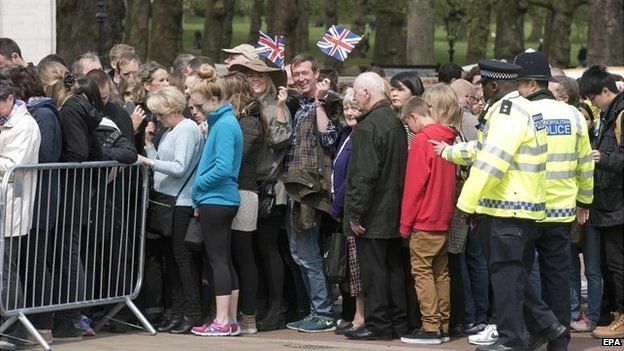 He told the waiting crowds the couple were "very happy". Both Catherine and her daughter are "doing well", Kensington Palace said. The name of the baby will be announced in due course. 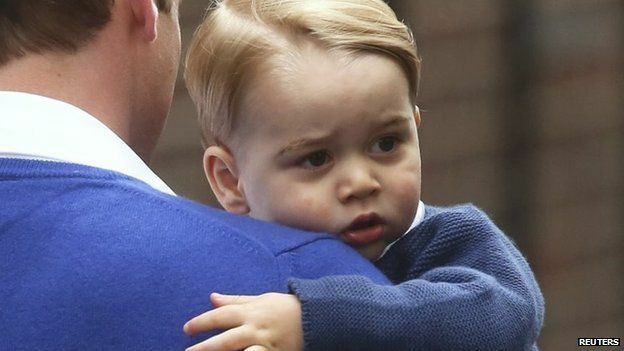 For live updates click here and for the royal baby special report, click here. The Prince of Wales, who had earlier said he was hoping for a grand-daughter, and the Duchess of Cornwall said they were "absolutely delighted". The duchess had been admitted to the private Lindo Wing at St Mary's Hospital in Paddington, west London, at 06:00 BST. The birth announcement came just after 11:00 BST. The statement from Kensington Palace added: "The Queen, the Duke of Edinburgh, the Prince of Wales, the Duchess of Cornwall, Prince Harry and members of both families have been informed and are delighted with the news." The latest royal joins the line of succession behind her grandfather Prince Charles, father Prince William and brother Prince George, who was born at the same hospital in July 2013. 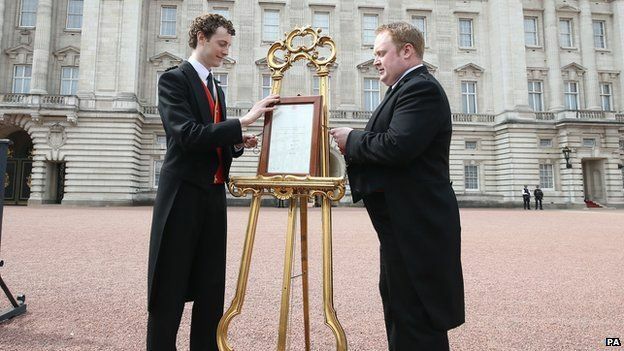 The princess is the Queen's fifth great-grandchild. Hundreds of well wishers have gathered outside St Mary's Hospital to catch a first glimpse of the new princess. 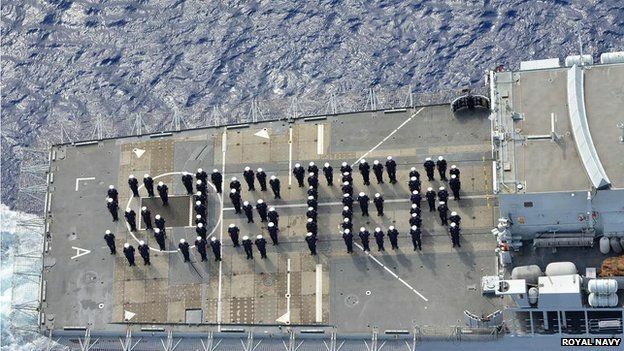 Some are seasoned royal watchers. Margaret Tyler, 71 from Wembley, north-west London, has been waiting for the last 11 days: "But no nights, I'm too old for that now". Meanwhile, Ash decided to bring his young daughter Ankita to mark the historic event. "We moved to London from the US nine years ago," he said. "I wanted to go and see Will and Kate's wedding but my wife thought I was mad." There has been lots of speculation about a name from small girls in the crowd, from Disney-inspired Belle and Ariel to Alex, Stella and Rose. And everyone wants a selfie with Tony Appleton, who runs a care home in Chelmsford, Essex, but has been a town crier for 30 years and stood on the steps of the Lindo wing to announce the news. Prime Minister David Cameron tweeted: "Congratulations to the Duke and Duchess of Cambridge on the birth of their baby girl. I'm absolutely delighted for them." Deputy Prime Minister Nick Clegg tweeted that he and his wife Miriam wished the family "all the best". And Labour leader Ed Miliband wrote: "Congratulations to the duke and duchess on the birth of their daughter. Wishing them lots of joy and happiness - and hopefully some sleep!" The Archbishop of Canterbury Justin Welby said: "It's wonderful news that the Duke and Duchess of Cambridge have a healthy new baby girl. 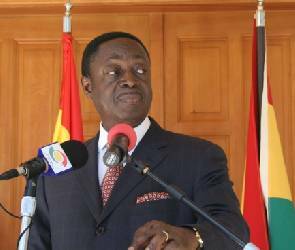 "Like many here and abroad, I'm delighted for the royal couple on this special day. May God bless them and both of their children with love, health and joy." 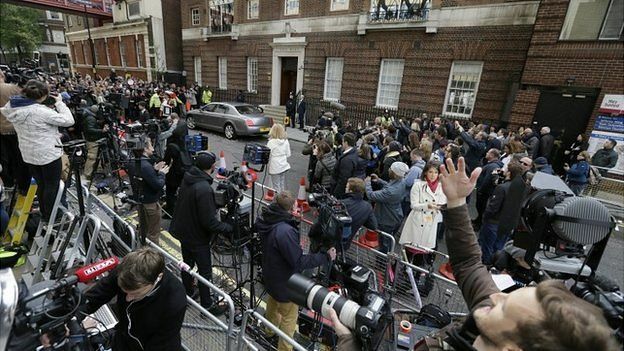 A large number of journalists, photographers and broadcasters had gathered after the announcement that Catherine was in labour. 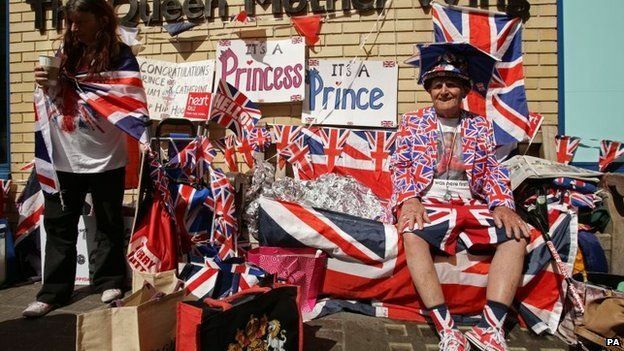 Following the announcement of the birth, standing on the steps of the Lindo Wing, unofficial town crier Tony Appleton told crowds: "We welcome with humble duty the new baby of their Royal Highnesses the Duke and Duchess of Cambridge. "The princess is fourth in line to the throne." BBC royal correspondent Daniela Relph said the wait now begins: "Will the duke and duchess and their new princess leave hospital today? All eyes are on the Lindo Wing door." There has been much speculation about the princess's name, with Alice being the favourite with several bookmakers. Charlotte, Elizabeth and Diana have also been popular with punters. Prince George's name was announced two days after his birth, which is a relatively quick turnaround compared with previous royal babies. It was seven days before the name of a newborn Prince William was announced in 1982, and there was a wait of a month following Prince Charles's birth in 1948. 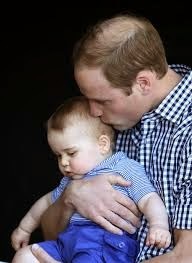 The new royal will not be overtaken in the line of succession by any future younger brothers. Under new rules which came into force in March, male bias was removed from the succession rules. She will also be known as the Princess of Cambridge after a Letter Patent was issued by the Queen. It declared: "All the children of the eldest son of the Prince of Wales should have and enjoy the style, title and attribute of royal highness with the titular dignity of prince or princess prefixed to their Christian names or with such other titles of honour". And the princess will also be able to marry a Roman Catholic without losing her place in line to the throne.